I got off a plane on Monday evening, having spent around 16 hours travelling from Colorado to Los Angeles, and back over to Hong Kong (with an additional six hours waiting around in airports). So it was an incredible pleasure to find a gorgeous bouquet of white roses waiting for me when I returned to the office yesterday, courtesy of Gift Flowers Hong Kong. 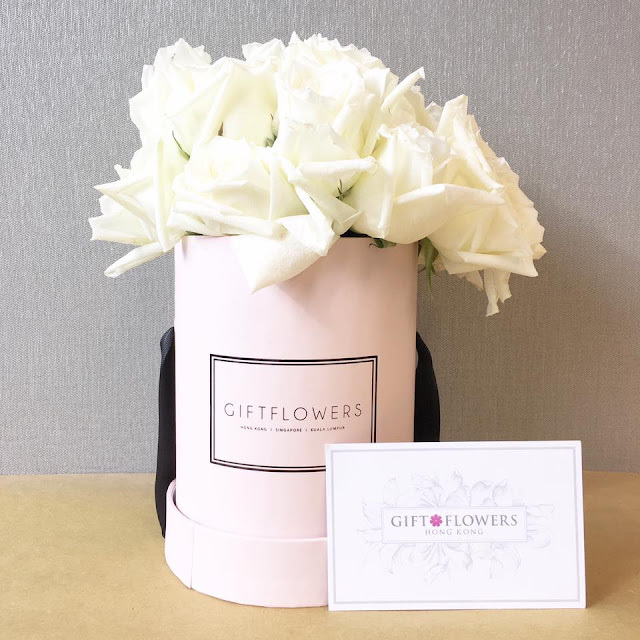 Gift Flowers Hong Kong offer a range of flower bouquets, boxed flowers, flowers with a vase, floral arrangements and flower stands, with a variety of customisations such as flower colour and the colour of the box that they come in. Best of all, there is free delivery within Hong Kong - and if you order by 1 pm on Monday to Saturday, they can even deliver the flowers on the same day (great for those looking for last minute gifts - yes, boys, I'm talking to you!). Gift Flowers Hong Kong generously sent me their standard size "Roses in Round Flower Box" (HK$699), which had 18 beautiful white short-stemmed roses in a ridiculously cute, pink round box. With a deliciously fragrant smell that reflected the high quality of the roses, I was reminded of an elegant scented candle - but even fresher. What made the flowers extra special was the message card that is provided free of charge with all orders, as well as their special flower care package, which includes cut "flower food" crystals in a small packet to help your flowers live longer, along with straight-forward picture instructions on how to care for them. I definitely recommend the beautiful boxed flowers - the adorable round box comes with ribbon handles and a lid, and can be re-used to store stationery, jewelry and other pretty bits and bobs! PS. We were sent these flowers on a complimentary basis in exchange for an honest review.